Great post Mr Lance. I love these trades. Some days all I see these failures. It keeps failing failing and failing :D. For now I prefer to trade only continuation and breakouts which I am more comfortable. But I will add these lovely contrarian plays in my toolbox in the future for sure. Wise decision. 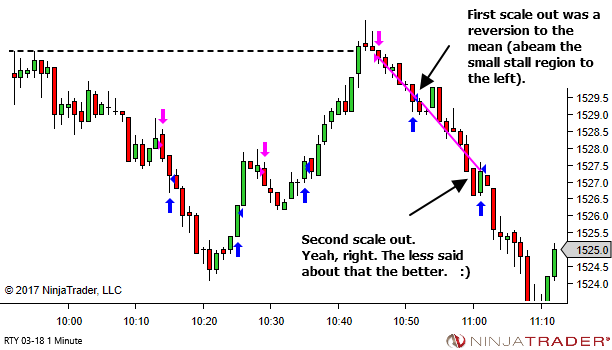 I generally think it’s best to trade only your preferred environment or setup type. Build consistency and success there. Others can always be added in the future. I’ve really enjoyed this short series of BOF plays. 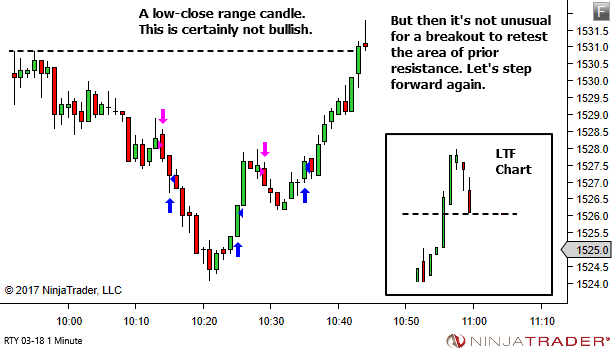 How do you determine whether the price action is bullish or over-extended when it is entering a S/R zone? Do you prefer to see a gradual trend to S/R and then a strongly bullish breakout for a BPB play? When I first saw the above chart I just thought the price action was strongly bullish given all the HCBCs. Do you have a way you distinguish what is strong and what is overextended? Great question. Yes it does appear bullish. Quite strong in fact. But think of a rubber band. They can only stretch so far before reaching a point where they need to snap back a bit. The same with price. This doesn’t necessarily mean a full reversal. 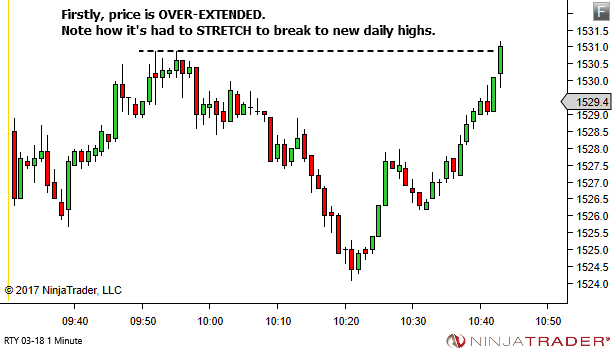 It might be just a reversion to the mean, setting up for another push at resistance. So how do I distinguish between what is strongly bullish and what is overextended? I don’t. They’re not mutually exclusive. The price action is both. The visual display of strength means I’m NOT interested in any TST of the level at all. I wait for it to break. 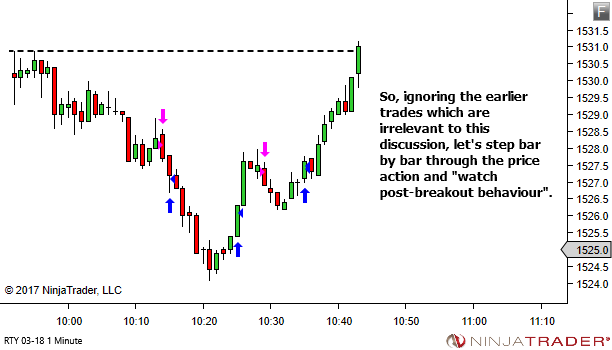 And secondly it means that I’m not stepping in front of the break with a limit order. It may rally. I’ll wait to see what happens after the break. But at the same time the over-extension means that it has potential for at least reversion to the mean. So, let it break. 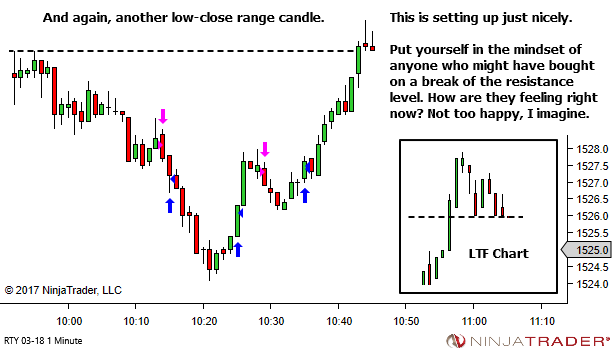 Then look at the LTF chart for weakness evident inside the latter moves of this overextended swing (post-break). 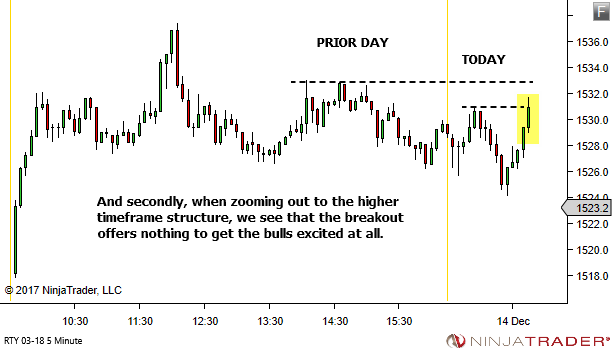 On the surface, looking at the TTF chart in isolation, these sort of trades give the appearance that they’re violating one of the fundamental YTC PAT principles – don’t fade strength. But it’s actually not. 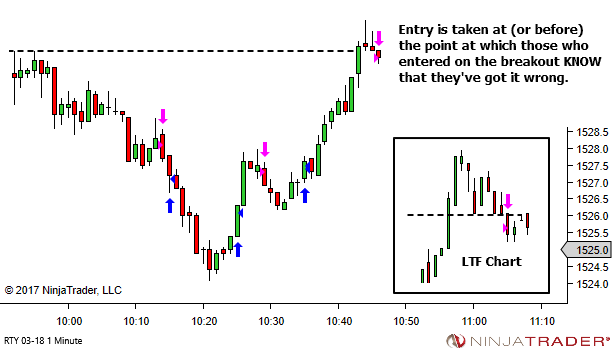 It’s recognising a long overstretched move with the internal LTF picture showing weakness in the latter post-breakout stages. Summary… look at the long distance price has already had to travel, just to achieve the breakout. Plus the final “stretch” to get through the level. This is primed for a BOF. Look at the LTF to confirm. Also… the article coming up this Friday could help answer the question as well. That’s a great response. I was thinking too binary; bullish OR overextended. But as you said it can be both depending on the context. Thanks a lot Lance that was a really clear explanation.